The tulips have bloomed to their full glory. 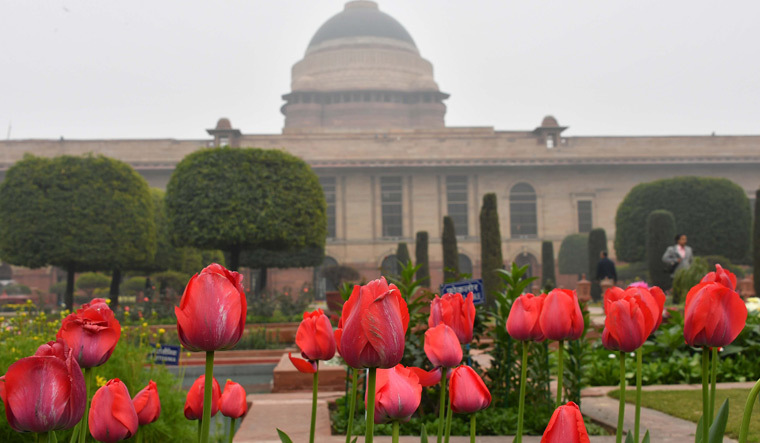 Unlike the tiny plants of previous years, when Rashtrapati Bhawan gardeners first tried growing tulips this year, the flowers are huge, bright and on tall stems, as if they are in Amsterdam, from where the bulbs were imported. This year, it is a duet though. Adding to the the enchantment of tulips is the double-petalled, night-scented stocks, imported from Japan. In a range of colours from a rich cream to a royal purple, the stocks form the perfect flowers for tiering at Rashtrapati Bhavan's Mughal Gardens. The gardens will be open to the public from February 6, and will remain open till March 10, barring Mondays. There is no entry fee, and in order to make the process of visitor management more efficient, the Rashtrapati Bhawan has started online bookings. Those who come via online bookings will be in a separate queue. The bookings have already started on presidentofindia.gov.in, rashtrapatisachivalaya.gov.in, and https://rb.nic.in/rbvisit/visit_plan.aspx. With over 70 species of seasonal flowers including dahlias, cyclamens and pansies, as well as 437 varieties of roses, the gardens are a treat to the eyes. There are plenty more attractions in the form of a spiritual garden, which has trees that are considered holy in different religions; a medicinal plants garden and the bonsai and tactile gardens. You can also team up the visit to the garden with a trip to Rashtrapati Bhavan museum, which was inaugurated a couple of years ago. “It has a rich collection of memorabilia, including the original plans of the gardens,'' said the museum in-charge, Kumar Samresh. The museum is a ticketed visit, Rs 50 per head, and there is a group discount. The tickets can either be booked online or bought the the venue.